In 2013 a series of Tesla Model S car fires occurred in which the battery packs were punctured, quickly causing a fire. The fires got a lot of attention, and Tesla Motors quickly took care of the situation. They developed a temporary fix - by instructing the cars to ride higher, to lessen the risk of battery pack puncture. The final fix was to add titanium shields to the underbody. "It&apos;s a scary event," Straubel said of the fire. "We don&apos;t want to ever have a fire, but stuff happens in the real world. The big difference is the car was in an accident. There was a collision. There&apos;s a world of difference between an accident or collision and a spontaneous fire." "The vehicle performed great," Straubel said of last week&apos;s accident. "We have firewalls built inside the battery system so that&apos;s the only part that is affected. The fire didn&apos;t get into the cabin, and the driver of the vehicle was hugely appreciative." "Autopilot will be inevitable and transformational for cars, and not just electric cars," Straubel said. "We&apos;re investing quite a bit of time in this, and we&apos;re investing in a large team. I think this will happen sooner than people think. Every airplane has autopilot. In cars, vehicle drivers are probably the least trained operators. This will have a huge, positive impact on transportation safety." Tesla Motors stock recovers after car fire explanation posted: Tesla Motors clear communication following lurid reporting of a car fire this week seems to have defused what could have been a major public relations crisis. Model S Fire By Elon Musk, Chairman, Product Architect & CEO - Clear and concise explanation of the incident based on Tesla&apos;s forensic investigation. Note that the NHTSA cannot send out an investigative team because there is a government shutdown underway, thanks to ridiculous Republicans in Congress. Earlier this week, a Model S traveling at highway speed struck a large metal object, causing significant damage to the vehicle. A curved section that fell off a semi-trailer was recovered from the roadway near where the accident occurred and, according to the road crew that was on the scene, appears to be the culprit. The geometry of the object caused a powerful lever action as it went under the car, punching upward and impaling the Model S with a peak force on the order of 25 tons. Only a force of this magnitude would be strong enough to punch a 3 inch diameter hole through the quarter inch armor plate protecting the base of the vehicle. Had a conventional gasoline car encountered the same object on the highway, the result could have been far worse. A typical gasoline car only has a thin metal sheet protecting the underbody, leaving it vulnerable to destruction of the fuel supply lines or fuel tank, which causes a pool of gasoline to form and often burn the entire car to the ground. In contrast, the combustion energy of our battery pack is only about 10% of the energy contained in a gasoline tank and is divided into 16 modules with firewalls in between. As a consequence, the effective combustion potential is only about 1% that of the fuel in a comparable gasoline sedan. Elon Musk: gasoline car fires five times more likely than Tesla Model S car fires - Tesla Motors gives their explanation of the recent Tesla Model S car fire, saying the car&apos;s safety systems worked as designed, and that the Model S is safer than gasoline cars. Yes, Teslas can catch fire but keeping cool is in order - A description of the Tesla car fire, coupled with a plea to remain calm. First, the fire illustrated once again how difficult lithium ion battery fires are to put out. Firefighters thought they had it put out, but it reignited. The second negative is that the accident raises questions about how well protected the battery is. The Tesla battery spreads out over most of the floor of the car. Contrast that to the battery on the Chevy Volt, which is tucked up inside the car, actually taking up space within the passenger compartment to keep it out of harm&apos;s way. "The bar is much higher for Tesla," said James Albertine, analyst at Stifel, Nicolaus & Co, who has a "hold" rating on Tesla shares. "Tesla cannot weather a sustained onslaught of consumer complaints and incidents that could potentially dent the demand curve for the next vehicle." Clarence Ditlow, executive director for the Center for Auto Safety, said there was a "design issue" with the Tesla battery if an object striking the bottom of the car could lead to a fire. The head of the consumer watchdog group called on U.S. safety regulators to set industry standards, including additional protection under the battery packs in EVs. How Does The Tesla Model S Ace Safety Tests, But Catch on Fire? - Explores how a car that claimed to have a better-than-perfect safety rating could catch fire like this. The Model S&apos;s steel plate keeps its battery protected during everyday driving. But it also made the fire department&apos;s job trickier, Ohashi said. "Typically when you have a car fire, it&apos;s relatively easy to access the battery," he said. "This battery was buried deeply in the front portion of the car, so gaining access to the fire was an issue." Jeff Chamberlain, deputy director of the Joint Center for Energy Storage Research at Argonne National Lab in Illinois, said that like in any other battery fire, it comes down to a short circuit. "If you puncture any battery, whether it&apos;s lead-acid, alkaline or lithium-ion, you&apos;ll create a short circuit and make connections across interfaces that you should not be making." he said. "When that short occurs, it creates heat and energy, which causes the fire." Please Calm the Hell Down About the Tesla Model S Fire - A very good contextualization of the incident, noting that energy storage systems in general are problematic. In an incident report released under Washington state&apos;s public records law, firefighters wrote that they appeared to have Tuesday&apos;s fire under control, but the flames reignited. Crews found that water seemed to intensify the fire, so they began using a dry chemical extinguisher. This is consistent with a lithium battery fire - that it cannot be put out by normal means. After dismantling the front end of the vehicle and puncturing holes in the battery pack, responders used a circular saw to cut an access hole in the front section to apply water to the battery, according to documents. Only then was the fire extinguished. Analysts said the news and imagery of the burning car would certainly be a public relations nightmare for the Silicon Valley-based electric carmaker, led by billionaire Elon Musk. "The fire was caused by the direct impact of a large metallic object to one of the 16 modules within the Model S battery pack," Tesla spokeswoman Elizabeth Jarvis-Shean said. "Because each module within the battery pack is, by design, isolated by fire barriers to limit any potential damage, the fire in the battery pack was contained to a small section in the front of the vehicle," she added. Why is a flaming Tesla such big news? Normally, in a case like this, the public could get some clarity via an NHTSA investigation. But, the AP reports, the NHTSA&apos;s field investigations have been suspended due to the government shutdown. Tesla Model S battery pack catches fire, nobody injured, TSLA stock price dives - Updated information on Monday&apos;s Tesla Model S fire clarifies that the battery pack caught fire, and that Tesla&apos;s battery pack design limited the spread of the fire, limiting the damage risk. This is the event electric vehicle activists hoped would not happen, an electric car with its battery clearly on fire. A Tesla Model S Caught Fire After A Crash. So What? "Yesterday, a Model S collided with a large metallic object in the middle of the road, causing significant damage to the vehicle. The car&apos;s alert system signaled a problem and instructed the driver to pull over safely, which he did. No one was injured, and the sole occupant had sufficient time to exit the vehicle safely and call the authorities. Subsequently, a fire caused by the substantial damage sustained during the collision was contained to the front of the vehicle thanks to the design and construction of the vehicle and battery pack. All indications are that the fire never entered the interior cabin of the car. It was extinguished on-site by the fire department." Batteries Burned In Tesla Model S Fire, Firefighters Say - The report from the Kent Washington fire department makes it clear this was a battery fire. Tesla Model S Driver Hits Object On HOV Lane Near Kent, Washington, Car Smokes, Catches Fire; Is Lithium Battery Dangerous? News was able to reach the English speaking press finally, thanks to a blog post. "We were able to contact the driver quickly and are pleased that he is safe. This was a significant accident where the car was traveling at such a high speed that it smashed through a concrete wall and then hit a large tree, yet the driver walked away from the car with no permanent injury. 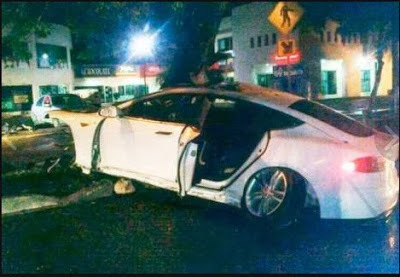 He is appreciative of the safety and performance of the car and has asked if we can expedite delivery of his next Model S."
Guiador "fantasma" choca lujoso vehiculo electrico en la glorieta del pocito en Morida - The initial report from a newspaper in Mexico. It reads like a normal car accident report. The driver was speeding, hit part of a roundabout, slammed into a barrier, the driver, identified as Orlando Castillo, and others, fled on foot, with the car catching fire. Choca varias veces e incendia su auto - Another local report from the same day. Said the driver, under the influence of alcohol, lost control, hit an electric fence, hit a house, went into a tree, and then the car caught fire. In this report they say the driver got into another vehicle, and fled in that car. The Model S was consumed by the fire and then taken away. 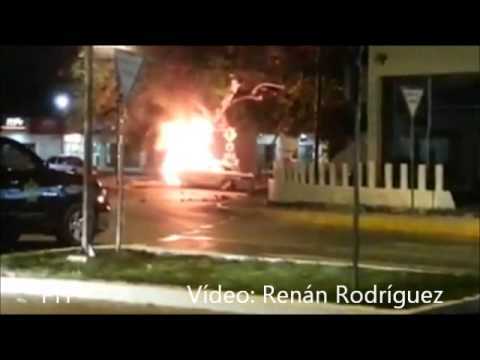 The incident occurred either in Merida, Yucatan, Mexico or in a small town north of it. We see on the map that Merida is in near the Northern coast of the Yucatan, that nearby is Cozumel and a big golf course named the Jack Nicklaus Golf Academy. Going by that picture (from Progreso Hoy) the front end of the car ended up on what looks like a guard rail, and was pretty well demolished. On November 6, 2013 a Tesla Model S being driven on I-24 south of Nashville TN hit a "tow hook" (road debris) which punctured the battery pack, causing a fire. The NHTSA is disputing Musk&apos;s claim that it was Tesla Motors which requested the investigation. "In regards to Tesla, the agency notified the automaker of its plans to open a formal investigation and requested their cooperation," the agency said, "which is standard agency practice for all investigations." "Investigations are independent," Strickland told The Detroit News in an interview after the hearing. "We have never -- in my recollection, before I got to NHTSA (as a Senate staffer) or as administrator -- have actually had an automaker ask for a formal investigation, but it causes a couple of implications: If a manufacturer asks me or asks the agency for a formal investigation, you&apos;ve already made a determination that you may have a defect that imposes an unreasonable risk to safety... I don&apos;t think that would ever happen." If that happened, then under federal law Tesla would be compelled to recall the vehicles. A Tesla spokeswoman didn&apos;t immediately comment on the discrepancy. Jim Chen, Tesla&apos;s vice president of regulatory affairs, said in a phone interview today that he requested the probe on a call with NHTSA&apos;s staff on Nov. 15 -- the same day Strickland said the agency ordered the inquiry. Chen said he asked for the investigation before NHTSA told him one would occur. Karl Brauer, senior analyst at Kelley Blue Book, said Musk can&apos;t rely on his statements that the Model S catches fire less often than gasoline-powered cars. "While only three Tesla fires have occurred, that&apos;s three more than I&apos;m aware of for the Nissan Leaf, which has sold in greater numbers while being on the market longer," he said in an e-mail. "Is there an inherent design flaw in the Tesla&apos;s battery pack that makes it more prone to fires compared to other electric cars? That&apos;s what NHTSA will be determining." The Mission of Tesla By Elon Musk, Chairman, Product Architect & CEO - The company announces their plan to mitigate the firestorm of concern. Since the Model S went into production last year, there have been more than a quarter million gasoline car fires in the United States alone, resulting in over 400 deaths and approximately 1,200 serious injuries (extrapolating 2012 NFPA data). However, the three Model S fires, which only occurred after very high-speed collisions and caused no serious injuries or deaths, received more national headlines than all 250,000+ gasoline fires combined. The media coverage of Model S fires vs. gasoline car fires is disproportionate by several orders of magnitude, despite the latter actually being far more deadly. Journalists with a deep knowledge of the car industry, such as the news editor of Automotive News, understand and attempt to rebut this notion, but they have been drowned out by an onslaught of popular and financial media seeking to make a sensation out of something that a simple Google search would reveal to be false. I would also like to express appreciation for the investigative journalists who took the time to research and write an accurate article. The degree to which this is outrageous is described well in the above-mentioned Automotive News article. There are now substantially more than the 19,000 Model S vehicles on the road that were reported in our Q3 shareholder letter for an average of one fire per at least 6,333 cars, compared to the rate for gasoline vehicles of one fire per 1,350 cars. By this metric, you are more than four and a half times more likely to experience a fire in a gasoline car than a Model S! Considering the odds in the absolute, you are more likely to be struck by lightning in your lifetime than experience even a non-injurious fire in a Tesla. First, we have rolled out an over-the-air update to the air suspension that will result in greater ground clearance at highway speeds. To be clear, this is about reducing the chances of underbody impact damage, not improving safety. The theoretical probability of a fire injury is already vanishingly small and the actual number to date is zero. Another software update expected in January will give the driver direct control of the air suspension ride height transitions. Second, we have requested that the National Highway Traffic Safety Administration conduct a full investigation as soon as possible into the fire incidents. While we think it is highly unlikely, if something is discovered that would result in a material improvement in occupant fire safety, we will immediately apply that change to new cars and offer it as a free retrofit to all existing cars. Given that the incidence of fires in the Model S is far lower than combustion cars and that there have been no resulting injuries, this did not at first seem like a good use of NHTSA&apos;s time compared to the hundreds of gasoline fire deaths per year that warrant their attention. However, there is a larger issue at stake: if a false perception about the safety of electric cars is allowed to linger, it will delay the advent of sustainable transport and increase the risk of global climate change, with potentially disastrous consequences worldwide. That cannot be allowed to happen. Third, to reinforce how strongly we feel about the low risk of fire in our cars, we will be amending our warranty policy to cover damage due to a fire, even if due to driver error. Unless a Model S owner actively tries to destroy the car, they are covered. Our goal here is to eliminate any concern about the cost of such an event and ensure that over time the Model S has the lowest insurance cost of any car at our price point. Either our belief in the safety of our car is correct and this is a minor cost or we are wrong, in which case the right thing is for Tesla to bear the cost rather than the car buyer. Manufacturer: Tesla Motors, Inc Products: 2013 Tesla Model S Population: 13,108 (Estimated) Problem Description: Deformation/intrusion into the propulsion battery by roadway debris may result in a thermal reaction and fire. Summary: The Office of Defects Investigation (ODI) is aware of two incidents occurring on US public highways in which the subject vehicles caught fire after an undercarriage strike with metallic roadway debris. The resulting impact damage to the propulsion battery tray (baseplate) initiated thermal runaway. In each incident, the vehicle&apos;s battery monitoring system provided escalating visible and audible warnings, allowing the driver to execute a controlled stop and exit the vehicle before the battery emitted smoke and fire. From a Model S owner in Tennessee By Juris Shibayama, MD - The driver of the car in question writes of his experience. It&apos;s almost identical to the previous fire near Seattle in that he was driving down the highway, ran over an object, then the car warned him to pull over, which he did, and then the car caught on fire. I was driving home from work on the interstate in the right lane at approximately 70 miles per hour, following a truck. In the middle of the lane, there was a rusty three-pronged trailer hitch that was sticking up with the ball up in the air. The truck in front of me cleared the object. I did not have enough time to swerve to avoid the hitch, and it went below my car. I felt a firm "thud" as the hitch struck the bottom of the car, and it felt as though it even lifted the car up in the air. My assistant later found a gouge in the tarmac where the item scraped into the road. Somewhat shaken, I continued to drive. About 30-45 seconds later, there was a warning on the dashboard display saying, "Car needs service. Car may not restart." I continued to drive, hoping to get home. About one minute later, the message on the dashboard display read, "Please pull over safely. Car is shutting down." I was able to fully control the car the entire time and safely pulled off the left shoulder on the side of the road. I got out of the car, and started to get all my belongings out. About 5-10 seconds after getting out of the car, smoke started to come from the front underbody of the car. I walked away from the vehicle to a distance of about 100 yards. More smoke started to come out of the bottom of the car, and about two minutes after I walked away, the front of the car caught on fire. With Tesla Motors shares plunging, is it time to start buying stock? The lawsuit is covering a period between May 10, 2013 and November 6, 2013, corresponding to financial results releases for Q1 2013 through Q3 2013. The Complaint alleges that throughout the Class Period, Defendants made false and misleading statements and failed to disclose material adverse facts about the Tesla&apos;s business, including: (1) Tesla&apos;s statements about the Model S&apos;s highest safety rating and its lack of prior fire incidents were materially misleading, due to undisclosed puncture and fire risks in its undercarriage and lithium ion battery pack; (2) the Model S suffered from material defects which caused the battery pack to ignite and erupt in flames under certain driving conditions; (3) Tesla&apos;s future sales, its next generation Model X introduction, and its stock price were extremely vulnerable to the inherent risk posed by the Model S&apos;s undercarriage and battery pack design flaws; (4) Tesla was unable to maintain a level of automobile deliveries sufficient to satisfy analyst concerns and compensate for other declining revenue streams; and, (5) as a result of the foregoing, Tesla&apos;s public statements were materially false and misleading at all relevant times. For the upstart automaker, this is a "Tylenol moment." By that I&apos;m referring to the 1982 series of killings that were linked to the painkiller, which was poisoned and then replaced on store shelves. The analogy here isn&apos;t to suggest that Tesla, like Johnson and Johnson, is completely without fault. It remains to be seen whether the Model S will require some kind of modifications to be made safer when encountering road debris. Bravado from CEO Elon Musk won&apos;t cut it to restore confidence in the cars. Tesla quite literally needs to make some sort of changes to the vehicle to mitigate the risk of these kind of fires even if it determines the risk is no higher than gasoline-powered cars. A statistical analysis showing that Teslas are still safe won&apos;t matter to buyers who are nervous, and it&apos;s actually bad business for Tesla to try that tactic. In crisis, company&apos;s are made or broken. "To have one instance of fire from road debris is a fluke," said Clarence Ditlow, director of the Washington-based Center for Auto Safety. "To have two road debris fires in a vehicle population that small is highly unusual." But the design of the Tesla Model S differs from the Volt, Leaf and all other EVs for sale today in one key respect. Tesla placed the Model S battery pack along the vehicle&apos;s underside, where it could be easily accessed and even swapped quickly by an automated system Tesla has said it would offer in the future for five-minute recharging. Most other EVs, typically based on the chassis of a gas-powered model, place their battery packs toward the rear of the vehicle where the fuel tank would normally go; in the Volt, the pack was designed with a T-shape running in the center of the car. Such designs keep the packs away from the front of the vehicles -- where roughly 70 percent of crashes strike -- and leave a smaller area for debris to hit. The accident occurred near Murfreesboro, Tennessee, at about 1:35 p.m. local time yesterday on Interstate 24, Dalya Qualls, a Tennessee Highway Patrol spokeswoman, said in an e-mail. The driver, identified as Juris Shibayama, struck a tow hitch that was in the middle of a lane, which damaged the car&apos;s undercarriage and caused the fire, Qualls said. Shibayama was able to pull the car over to the side and was uninjured, Qualls said. Comparing the picture above to the picture below demonstrates the firefighters had to tear apart the front of the Model S in order to eliminate the fire. This was also true for the Kent WA fire. "For a company with a stock price based as much or more on image than financials, those recurring headlines are highly damaging," Kelley Blue Book senior analyst Karl Brauer said. The vehicle was driven by Juris Shibayama, 38, of Murfreesboro, Tennessee, according to the highway patrol. The incident occurred on I-24 south of Nashville, Tenn., at about 1:30 p.m. local time. Photographs posted online show the Model S pulled over to the median strip, with a fire smoldering in the front trunk area. Two people are seen walking in the median, one wearing what looks like surgical scrubs. The car had no apparent damage, other than what was caused by the fire. It appears the fire did not reach the passenger compartment. Tesla provided this official statement: "We have been in contact with the driver, who was not injured and believes the car saved his life. Our team is on its way to Tennessee to learn more about what happened. We will provide more information when we&apos;re able to do so." TSLA stock price quote on next day. The price drop on November 6 was due to reaction to the Q3 2013 financial results released the day before. The drop on November 7 would be resulting from a combination of that, and news of the fire. teslamotorsclub.com Ugh-Another-Model-S-fire-2013-11-06 - Discussion thread. 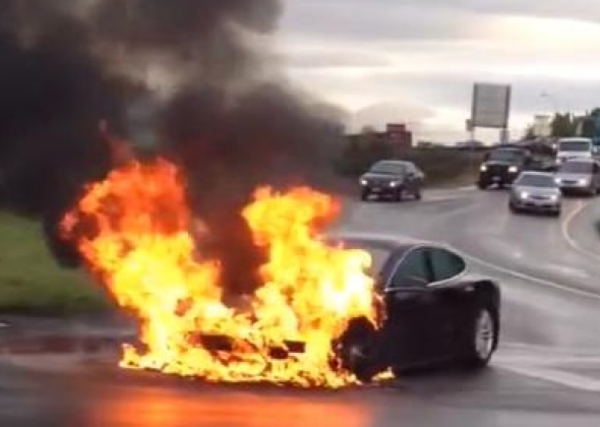 Early in the morning of July 4, 2014, another Tesla Model S caught fire. It had been stolen, and Police were chasing the vehicle at high speeds over 100 miles/hr in Hollywood. The chase ended when the Model S collided with several other cars. It split in half, and caught fire. The occupants of the Model S and other cars werre sent to hospitals in critical condition.